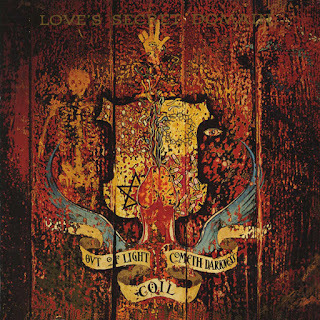 Coil is possibly the most overlooked electronic act in recent memory. Throughout their whole career they’ve pushed boundaries in so many strange ways, and while not all results were positive they allowed the room to re-distinguish what music could become. In turn, Love’s Secret Domain’s appeal has nothing to do with its dynamic instrumentation or its eclectic styles throughout the songs. The fact that makes this such an interesting album is merely detail. Naturally since this came out during the great electronic revolution they pertained to certain relevant aspects such as rhythmic foundations, but also include an almost scary amount of other influences, such as jazz-fusion, post-gothic, and even some literary citations. The record is meant to be taken almost ironically just by the title Love’s Secret Domain (LSD), but there’s so many other levels of philosophy and ambience that you literally have no idea where the record is going. Now, is this a bad thing, or merely a musical experiment of social/unspoken dialect"
Just like with any experiment it works both ways. Disco Hospital opens the record with nothing more than a collection of noises on a mixing board, but flows right into Teenage Lightning, Pt. 1, a very…very strange composition of buzzes, bangs, and twangs randomly landing over a consistent rhythm melody. If you weren’t confused enough, Things Happen introduces Annie Anxiety, a stage actor from New York, in a completely dazed yet nonchalant spoken-word performance over a mid-tempo, nightmarish theme that completely alters the tone from the first two tracks. The album loves to take sudden turns like this in order to cover a vast amount of ground in terms of emotions and topics and ideas, which is immediately obvious if you were to compare The Snow, essentially a frigid dance track consisting of what you would expect, as well as a consistency of ever-evolving layers and samples, to Dark River, a very hollow ambient piece, or to Windowpane, a vocal-driven modulation of world music influence. From the reference to The Divine Comedy in Titan Arch to the pseudo-philosophy rant about a demented view of love from the title track to the complete circle back to the lightness of Teenage Lighting, Pt. 2, it’s not necessarily apparent whether or not the album is meant to be taken in a linear way. Does the song order deal with a stream-of-consciousness concept of what goes through one’s head when evolving into one who loves or becomes loveless, or even a path where cohesiveness is just too weird to make the concept fit" This isn’t meant for a few listens before you move on to something else, you really have to delve into this record to make your own story of what the purpose is to you because frankly that’s probably why the band made it so vague and out of balance. It wasn’t meant to make sense because the concept they’re tackling doesn’t make sense. Obviously, like previously mentioned, some parts just don’t work in their method, such as Further Back And Faster’s 8-minute trek of percussion tracks or Chaostrophy’s lack of identity, however the soul of the record never cracks into useless convolution of other principles. If you want a record that needs to grow into you, you’ll be hard-pressed to find something anything else as strangely, neurotically, or overwhelmingly ensnaring.